Egypt on Wednesday slammed the U.N. chief for calling for a fair trial for two prominent rights activists accused of illegally receiving foreign funds for their non-government organizations — the latest sign of Egypt's growing impatience with criticism of its human rights record. Foreign Ministry spokesman Ahmed Abu Zeid said in a statement that comments by U.N. Secretary-General Ban Ki-moon were an attempt to intimidate Egypt's judiciary and meddle in its affairs. A spokesman for Ban said in a statement late Tuesday that he was "following closely" the government's legal case against NGOs over the foreign funds issue and that the two activists — Gamal Eid and Hossam Bahgat — should "benefit from all due process and fair trial standards." Ban's comments, said Abu Zeid, are "attempts to intimidate the Egyptian judiciary and influence its work, which does not fall within the mandate or responsibilities of the entity from which they are issued, and does not conform to its consistent claims of respecting the rule of law and judicial independence." Human rights activist Gamal Eid is seen at a court in Cairo, March 24, 2016. 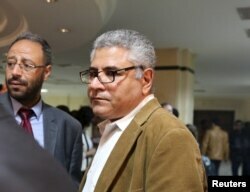 Eid and Bahgat appeared Wednesday before a criminal court in Cairo that was to decide whether to freeze their assets. The court ruled to postpone the case until May 23. Eid is the founder and director of the Arabic Network for Human Rights Information. Bahgat, founder of the Egyptian Initiative for Personal Rights, is now among Egypt's most prominent investigative journalists. President Abdel-Fattah el-Sissi's government has placed restrictions on civil rights groups at a time when criticism is growing of the country's human rights record, particularly police abuse. The case of an Italian doctoral student abducted, tortured and killed in the Egyptian capital earlier this year has fueled the criticism and poisoned Cairo's close ties with Rome. Italy has withdrawn its ambassador from Egypt in protest against what it says is the lack of full cooperation by Egyptian investigators in the case of the student, Giulio Regeni. El-Sissi has denied any involvement in the case by Egypt's security forces. The case against Eid and Bahgat is part of a wider legal drive by authorities against NGOs over the issue of foreign funding. The legal proceedings began in 2011, became dormant for a few years, but were recently revived. Earlier this week, authorities decided to start separate legal proceedings to freeze the assets of four other rights activists in what appears to be an escalation in the face of the growing criticism from abroad. A first hearing in that case was held Wednesday, but was adjourned until May 23 after the prosecution requested time to study the case. Egypt's human rights record figured prominently during a visit here this week by French President Francois Hollande, whose country is a key foreign backer of el-Sissi's government with multi-billion dollar investments and arms sales. "Here, we are safeguarding 90 million people who must live," el-Sissi said in reply to a reporter's question during a joint news conference with Hollande. Then, in a stern warning, he added: "You have no idea what will happen to the region and to Europe if this nation collapses. We do not ignore human rights, but you must know that there are evil powers that work toward giving a negative impression about what is going on in Egypt."